Want to know how to get greener grass? As we approach the autumn months, we are asking if you had a great summer. Did you have the chance to get out in the garden? Or do you wish that you made a little more of your garden this summer? Let’s face it, nobody likes stepping outside to be greeted by a dull, lifeless garden. The first thing that catches your eye when stepping foot into the garden is the lawn. If said lawn is dry and patchy, then it takes a little shine out of your garden. Perhaps then it is time to make a few changes, and give your garden that new lease of life. It is time to speak to us here at Great Grass. Your Great Grass artificial grass will go a long way to enhance your garden, ensuring that it remains vibrant all summer and the rest of the year to come. Unlike many of the other artificial grass products currently out there, our artificial grass looks authentic, and will not disappoint. You won’t even be able to tell the difference. Here at Great Grass, our products are available in a number of different shades and pile heights to give you the lawn you have always wanted. So, say goodbye to weeding, cutting, mowing, fertilising, and watering and all the rest of the hard work that comes with maintaining a quality and hello to your brand new beautiful garden. Looking for realistic, resilient and longer-lasting artificial grass? Make sure that you choose Great Grass. 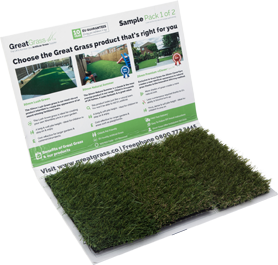 Contact us today on 0161 685 0071 for more information our great range of artificial grass products.